Kannaadipiddy is Chavakachcheri’s main cemetery, where Hindus and Christians of the town buried and cremated their dead. 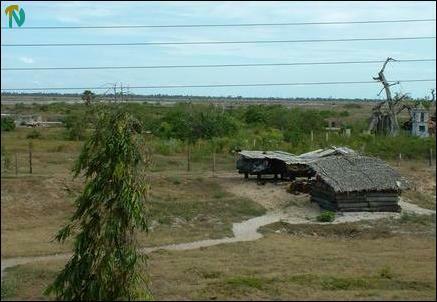 It is now inside the large southern sector of the town garrisoned by the Sri Lanka army. 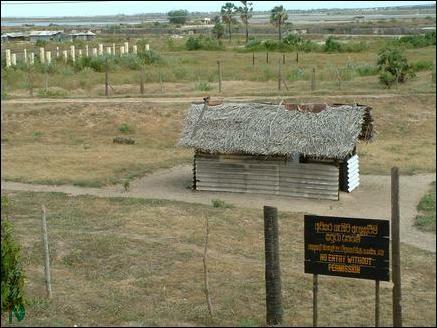 Residents have to obtain permission from the Sri Lanka army (SLA) to use the cemetery. Only very close relatives required to perform the last rites are permitted inside. Earlier this year a family burnt a corpse by the SLA checkpoint at an entrance to this high security zone, which leads up to the cemetery when soldiers refused to let the cortege through. About three thousand families that have resettled in the central and western suburbs of Chavakachcheri town rely on the Kannapiddy cemetery to bury their dead. “There are about four to five funerals a week," an official of the Chavakachcheri Urban Council (UC) told TamilNet. The town’s dilapidated UC building stands derelict by the high security zone. The UC administration functions now from a house on the other side of the town. The largest sports pavilion in the Thenmaradchi Division of Jaffna is also inside this garrisoned sector of the Chavakachcheri town. The UC sought permission from the SLA recently to use the damaged but still usable pavilion and its grounds recently to hold functions in connection with the local government week. One of the town’s main places of worship, the Veeramaahaliamman Temple is also inside the garrison. The temple is rapidly falling into a state of serious disrepair. “People who pass along the A9 through Chavakachcheri town would be inclined to presume that the scars of war are healing fast. The truth lies behind the road side parts of the town centre," the UC official said. Meanwhile, the SLA has constructed a new bunker to further secure the approach to the temple, pavilion and the cemetery.